An insight into the different services that can enhance your flexibility and reduce business risk, covering virtualization, cloud services and cloud-managed hybrids. Learn about the key considerations that should guide your decision making, helping you to identify the solution that’s right for your business. 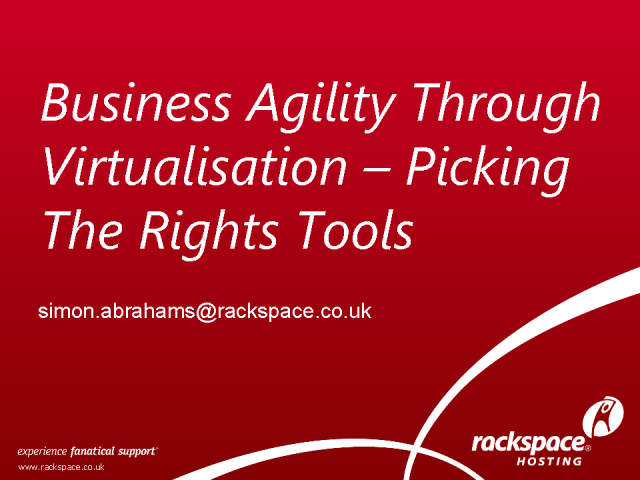 Simon Abrahams is Head of Product Marketing for Rackspace EMEA, with ownership of the EMEA product strategy, market positioning, and delivery of all new products. In this role Simon is responsible for aligning Rackspace’s product innovation initiatives with the needs of European customers, as part of Rackspace’s Fanatical Support commitment. Prior to Rackspace, Simon held product management and marketing roles in the Hosting divisions of COLT, Orange Business Services, Infonet and AT&T. In these positions Simon worked closely with customers to resolve business problems though innovative IT and high-performance networking.